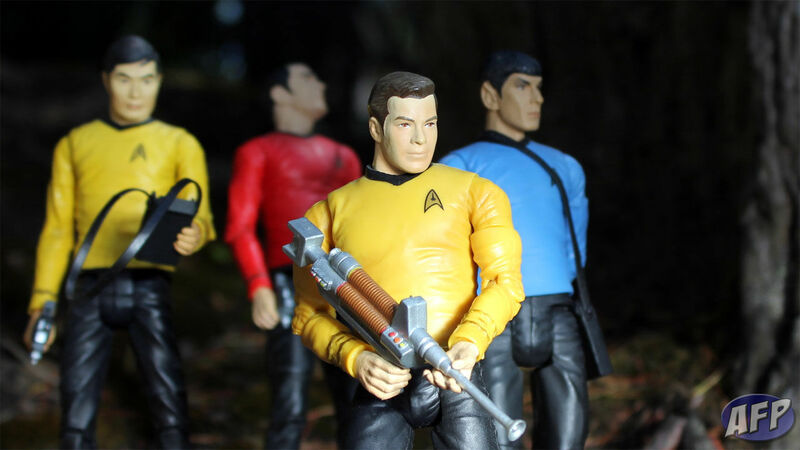 Art Asylum’s Star Trek figures for the original series are still a stand out in my collection. 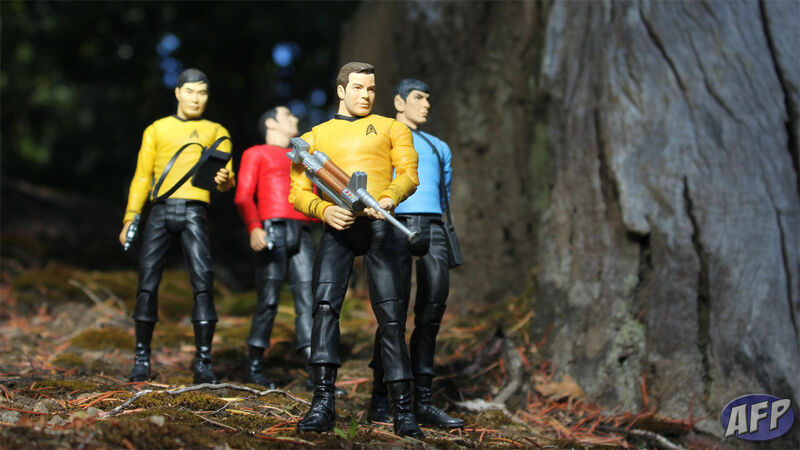 I love how they customized each figure for the character’s physical attributes – Spock is taller than Kirk, who is taller than Sulu. Today, we’d probably just get one single body reused over and over. The head sculpts are spot on too – Shatner’s is probably the toughest to capture, and I think they did a great job with it. I’ve wanted to take some shots of these guys for a while now, and this also became an opportunity to test out a quick and cheap light reflector I whipped up a while back. It hadn’t really done anything for my indoor shots, as I often have plenty of light available with my “studio” set up. So I took a little away team to the surface of planet RBY (Ron’s back yard) to see what the reflector could do with natural sunlight. The benefit of having a reflector handy is that you can redirect light where you need it. I’ve got a nice tree stump in the back yard that makes for an interesting backdrop, but it’s in an area that also gets a lot of shade. With the reflector, I can augment an existing light source or create a complementary light source, just by varying the position and angle of the reflector. In the lead-in picture for this article, I’ve used the reflector to create additional fill-in light coming from the left side of the frame, in front of the figures. The figures were in the shade for that shot, so the reflector added enough light such that I didn’t need to use my flash. For the shot directly above, I used the reflector to highlight Kirk while keeping the others relatively shaded. I wanted the focus on him, and this was easy to do just by altering the angle to exclude the other figures from the added light. I really love how this shot turned out, because with the reflector I was able to achieve a subtle lighting effect that I see used in the actual show. Here, the reflector is set up behind the figures on the left hand side, while the natural sunlight is coming from in front of the figures off to the right. The backlight effect highlights each figure’s head and right side, helping to bring them forward out of the background. It might be a little overdone on Scotty, but I love how it looks on Spock and Sulu in particular. 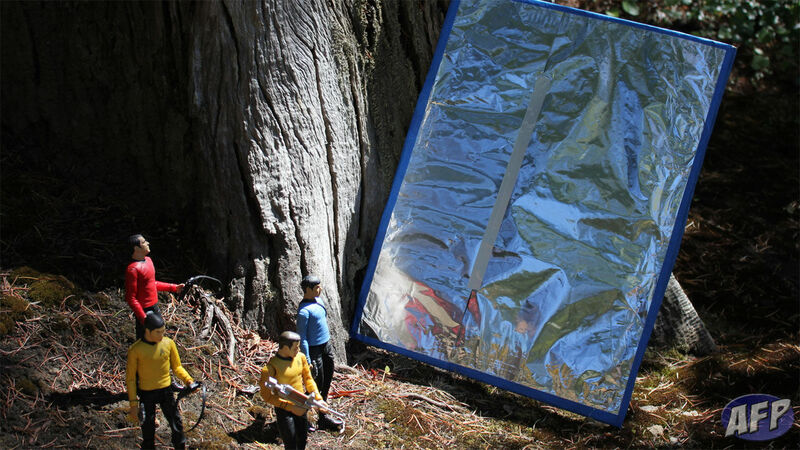 Finally, our landing party has encountered the reflector itself – and it’s about as cheap as some of the sets on the original show. All I’ve done here is taken the side and flap of one of the many cardboard boxes that show up here full of toys, reinforced it with another slab of cardboard so it will remain flat, and taped regular aluminum foil to it. There’s two sides to most foil, and I had the shinier side exposed as I wanted to reflect as much light as possible. Since my cardboard sheet was bigger than the foil, I used two pieces of foil – I used a piece of magic tape to hold the two pieces of foil together, but in retrospect I probably didn’t need it. Because the foil itself is not perfectly flat, there’s a shimmery quality to the light it throws off. It’s more noticeable the closer the reflector is to the subject – there’s some nice looks with it like that, so if you’re building your own cheap reflector, don’t worry if your foil gets crumpled. Give this a try, and let me know how it works out! thanks for the pointers! you should check out dst’s kirk as a romulan figure, it the best shatner likeness..at least for me. I do not collect 6 inch figures anymore but I might for this..
Nice. 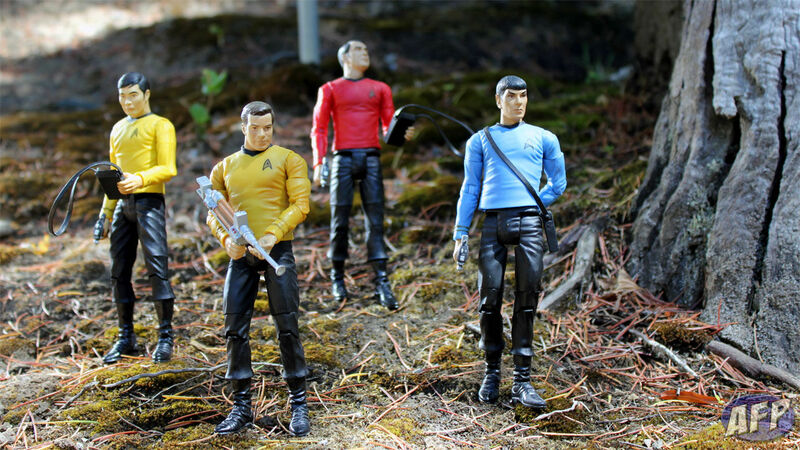 I love the posing on these guys, especially Spock with his hand behind his back. Good stuff. Makes me want to go outside and play with some toys. I’ve been working mostly in aperture priority mode but I’m having a hard time getting getting subtle lighting effects like you have with Kirk on the second shot. Next Next post: Play Imaginative Super Alloy Batman – the 1/6 Batman You’ve Been Waiting For?